Like butterflies caught in a breeze, windsurfers and kitesurfers swarm to Sanibel Causeway beaches, where the wind is most brisk and a local outfitter delivers equipment and lessons. The trip from Fort Myers to Sanibel involves three bridges (which were rebuilt in 2007) connected by small manmade islands. Once you reach the end of the Causeway bridge, and are on the island, you’ll be on Causeway Road until you get to Sanibel Island. The Visitors’ Center is on this street. 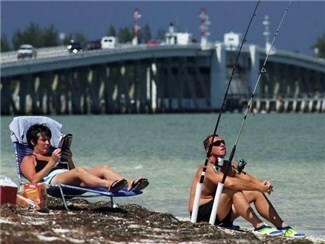 Cyclists staying in Fort Myers may prefer to ride the Causeway bridges rather than pay Sanibel’s parking rates. Bikes are definitely allowed on the bridges.